Season pork chop with salt and coarse ground pepper. Place saute pan on high heat and add oil. When oil just begins to smoke, place pork chop in pan and allow to sear (3-4 minutes) and reduce heat to medium. When first side is golden brown, flip pork chop over and cook another 3-4 minutes. Turn off heat and add crushed garlic, thyme and butter. 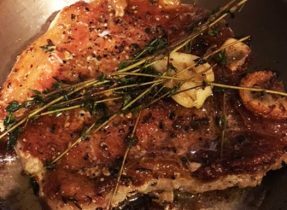 Using a large spoon, baste the butter over the pork chop. Allow to rest 5 minutes. Serve with roasted vegetables and applesauce.